One of my whisky savvy Chinese friends from Nanjing bought me a bottle of this and gave it to me the day before my wedding. I hadn't seen him in a year, and the first thing he says to me is "Hello Josh, I brought you whisky!" The best hello anyone could ask for. That evening the women started talking about things and stuff so we commenced to drinking the Kavalan...and the women kept talking...So we kept drinking. By the time they had shut up, half the bottle was gone. But we had a nice long whisky discussion about the distribution and prices of whisky in Asia among other things. Now it's a few days later and I'm taking the time to sit down with it. This bottle will be my third experience with solist Sherry and 5th with Kavalan I believe; all in Asia. This is one of the darkest whiskies I've had. Nose: Rich, dark sweet fruits. Juicy fruit gum. Plum, ripe leche fruit, sweet orange candies. Blackberries, blueberries, grapes. But with extra sugar and richness. More like fruit syrup. Palate: Liquid juicy fruit bubble gum. But with a big alcohol kick. Thick and chewy. Definitely one of the bigger kicks I've had from a whisky. Which I wasn't expecting from all that fruity sweetness earlier. Maybe because it's aged for less time at a faster pace? You know that overly sweet toothpaste you get at the dentist? Getting some of that too. Very interesting to say the least. I think this would benefit from a splash of water. Big fruit, lots of sugar, lots of alcohol. Finish: More juicy fruit bubble gum. Fruit candies. Overall: Big fruit, big alcohol, rich and thick. Thank you Tan, I will enjoy every drop, but I wouldn't spend over $150 on it. Thankfully it's cheaper here near the source. And you can crucify me for saying this, but I enjoyed this more out of a rocks glass then my snifter when neat. Perhaps it speads the fumes out and made it less of a kick in the face. Who knows. Good stuff Kavalan. Nice oomph. The last of a fearsome foursome of Kavalan Whisky tasted in-store. It was a mixed bag I was hoping this one would confirm the hype. A longer blabby version is on my blog. Nose: Coffee, dates, burnt chicory, Alpine bitters. Cooked grape must, slight balsamic edge, all things umami and it's sharp. This isn't a Christmas spice type sherry, it's a dirty big bodied sherry. After a while there is dry cured ham and pepper. Palate: Oh! ok...Sweetened coffee left out on counter overnight, date purée, ginger, gunpowder, an almost metallic, plastic note. It's very much on tannic, oversteeped teas, stewed prunes. There is more traditional spices in the mouth, nutmeg and allspice. Very dark and extractive. Palate with water is very thin, dates, plasticine, light roast coffees. Really all on chewy dates, spices and cake batter, you get more or that oxydized sherry nuttiness. The sherry lingers a long time. It's big stuff, maybe even a little tiring in a way. The Blab: Clearly the Solist editions are the ones to look out for. While that sherry cask haunted me for a couple of days, I'm not sure what I think about these whiskies, it seems that the casks (or the previous contents) are perhaps doing most of the heavy lifting. Oh and yes the price...just saying. Again, everyone disagrees with me. I enjoyed the Solist Bourbon Cask MORE than the sherry cask. Both are excellent though. Great review. @Georgy Do you think it out-monsters A'Bunadh and 105? I thought it was a bit sweeter than either of those and at least as big a sherry monster. OVERALL IMPRESSION: It's a good sherry bomb with some decent complexity, but, in my opinion, the oak influence was really way too aggressive here which didn't do this whisky any good. So, all things considered, it is not worth the price tag. If you're looking for a sherried whisky outside of Scotland, Amrut is the way to go. And it's cheaper too. As for its younger brother bottled at 46% - that one had too much match stick sulfur on the nose, not as sweet, but much sweeter on the palate (surprisingly). However, just like its big brother, it became more bitter the more water I added to it, with some ginger spice to it as well. The finish was short and really uninspiring. Agreed. Although I liked the big crash of flavors, more intense than sherry itself, I'm seldom in the mood for the big tannic dry-out. Glad I bought 5cl samples first, which helped convince me that the Vinho was the way to go. This was just too much of a sherry bomb for me. Huge and bit cloying. This year the biggest winner in MMA is still Kavalan, their Solist Sherry Cask won 4 category awards, including Supreme Champion. Aiming for the luxury market, Kavalan's marketing strategy has always been controversial, they put price tags on their 3yo Solists above most 18yo scotch single malts, but the price doesn't stop people from buying their whiskies. Kavalan's sales volume has boosted 390% in the USA this year, while the total sales in EU is more than twice of the sales in the USA. It seems the top-tier customers are crazy about Kavalan. The reviewed bottle is a 196ml sample of Sherry Oak cask strength which I recently bought in Kavalan's anniversary sale. After the bottling of single casks the remains were mixed and bottled as samples, so there's just Sherry Oak on the label, but it's about the same as Solist on ABV. Kavalan has diluted their Solists samples from 57% to 54% for a while, so this is probably an older batch. The bottle has been opened for two weeks. Nose: Big, ripe and fruity. Raisin, syrup, sherry, plum, orange and cherry brandy. Palate: Woody, the texture is oily and thick. Mango, cinnamon, sour cherry, white pepper, basil and burnt wood. The crisp red fruits hits first, followed by dried herbs, cola and oaky bitterness, making a nice twist in the middle. Finish: Dark chocolate, barely, nutmeg, roasted peanuts and coconuts. Medium length with clean cut. Balance: Huge flavors but restrained by the bitterness, all those sweet sherry, sour fruits, spicy herbs and bitter tannin jamming together, just wonderful. Thoughts: This whisky needs some time to soften, the fruits will come out nicely, better enjoy without adding water. Not youngish in every aspect, heavy and profound, big on flavor, unlike anything I tasted before. Although the price is not so approachable, but this is a must try for every whisky lover. @Victor here in Taiwan Kavalan Solist Sherry Cask is about $100 usd, probably the best price in the world. Kavalan Classic is trash to me, Concertmaster a bit more acceptable. King Car Conductor and Podium might be solid, but just ok for the price. Solist Vinho Barrique is out of stock everywhere, while Solist ex-Bourbon and Solist Sherry are easier to get. Luckily, Kavalan's stores have a lot of samples to buy, and people can even have a taste before buying, including Solist ex-Bourbon and Solist Sherry. @Victor yep, apparently Kavalan is greedy, Solist Sherry Cask should be tagged under $80 to be good price for me. The fact is their Classic and Solist ex-bourbon are not selling well, reflecting some of their whiskies' quality just don't meet the price. And for those over $200 or $300, well, I guess Kavalan just have more enthusiasm in making money than making good whiskies. @jeanluc @Pierre good choice for your Christmas whisky, and happy holidays! Kavalan distillery is located in the northern part of Taiwan, 60 kilometres south of Taipei. It was built over an eight month period in 2005 and 2006 and uses copper stills that were constructed in Scotland. The name of 'Kavalan' is taken from a group of indigenous people who once lived in Yi-Lan County where the distillery is based. This 'Solist' sherry cask strength expression was matured in ex-Oloroso sherry casks and comes with bottle code S060821040: in other words this is from a sherry cask, distilled on 21 August 2006, and from the 40th cask that was filled on that day. It was bottled in 2013. The nose starts with a punch of alcohol but soon gives way to rich flavours of sherry, together with some balsamic vinegar and followed by intense plum jam flavours. It then turns more syrupy, some herbal notes creep in, with a hint of furniture polish at the end. The palate is medium-bodied - in fact surprisingly thin given the ABV and the nosing experience - and spicy. Then there is bitter chocolate and liquorice. The finish is long, warming, and syrupy. The herbal notes are back, together with a healthy dose of wood spice and some notes of coffee. This is a sherried whisky on the extreme side. Nothing to sip quietly in the evening, one dram at a time is quite enough. I very much enjoyed the powerful and intense nose that, sadly, neither palate nor finish managed to live up to. @Pierre_W, wonderful review as always. I'm sure it's no surprise to hear that there's a good deal batch variation with Solists. I've had Sherry batches that I'd score no higher than your score above, while I scored my favourite bottle no less than 94. I hope you have better luck with your next Solist Sherry experience! Cheers. Thanks, @hunggar. Indeed that particular bottle was not too impressive but then I might have better luck next time. All in all I very much like anything that comes from Kavalan. Thanks for checking in. This is a bit mental. It is so dark you would never think it was a whisky. It looks like a glass of Oloroso sherry or coca cola. My bottle is 515/546 of cask SO60703030. The nose as you would expect is a massive hit of sherry. Thick, sweet dark fruits, dates, and raisins. A twist of liquorice, woody notes, nuts and vanilla. Sherry, lots and lots of sherry. The palate is an odd bag. Bitter wood, pepper, vanilla, dates and raisins. Oh why oh why oh why doesn't this taste like it smells. The balance is all wrong. I hope it is just a dodgy cask. THe nose is intriguing and alluring. It lets you think you are about to taste something amazing and then you take your first sip and a large dose of disappointment. It looks amazing, smells amazing, tastes weird. The realisation kicks in, what does a bottle of this cost...?face palm. What a wasted opportunity to create something magical. I want to try another bottle to see if it is just mine or not. Was entertaining purchasing a bottle of this...but at ~$175/bottle this review has me second guessing that. For those that have tried both this and the Amrut Intermediate Sherry, how would you compare/contrast the two? I can find the latter for just more than half the price. Update - I decided to revisit this bottle to see if it has improved with having been opened for a while. The good news is that is has. This is greatly improved although there is still a metallic note on the palate. I have bumped my score accordingly. Kavalan has bottled quite a few single sherry casks, all at natural color (and mine is quite dark). This cask yielded 546 bottles at a whopping 57,8%. I will keep my water close at hand. OMG! Deep sherry like you will only find it in Scotch at high age. Think Glenfarclas 40 Year Old! Dades, figs, raisin on rum, fresh plums and mirabelles, hints of rhubarb and coffee, milk chocolate. Walnuts. A drop of balasamico. Turkish delight. Eucalyptus. Adding water brings out a beautiful meaty edge. It has something fresh and fruity, but at the same time displays a maturity that belies the young age. Like I said: OMG! It is creamy and round, peppery and sweet at the same time. Red wine, berry marmalade, dark chocolate with raisins. A slight bitterness as if from grapefruit with cloves and cinnamon. This is devine stuff It does not really need water, but if you do add it, it loses none of the taste, merely a little punch. The finish lasts forever and remains fruity and spicy, even diluted. This is the best Kavalan I have tried so far. One to sip very slowly! A grand whisky that could easily hold its own in a line up with older Glenfarclas or GlenDronach. Getting hold of a bottle may prove quite a challenge, though. I sampled it at my local store a few day ago - it's just TOO much sherry for my liking... I find the GlenDronach single sherry cask offerings more subtle and classy, to be honest. But I'm sure sherry lovers will go nuts over this. Even though I'm back from a trip to Scotland - having brought back five bottles (six if you count a bottle of rum for my dad's 70th birthday) , and tasted countless more - I thought I would do a complete 180 and write up on - Taiwan. Go figure. Kavalan may be the future of whisky. Owned by Taiwanese food conglomerate King Car, Kavalan was built in 2005 and was the brainchild of King Car chairman TT Lee. Consultant Jim Swan worked with master blender Ian Chang to develop very distinctive award-winning whiskies, the best known of which are cask strength, single cask single malts. As you can imagine given the climate, maturation works quickly - especially in warehouses that are five stories tall! Kavalan Distillery is huge, on enormous grounds and is a major tourist attraction in Taiwan. Most who have an insight into the worldwide whisky industry will tell you that, given the inevitable growth and global influence of Asia in all areas of business and culture, whiskies such as Kavalan (and future whiskies that will come out of China) will, over years and perhaps decades, become the norm rather than the exception. The Sherry Cask Solist is a cask strength single cask malt. This particular bottle (one of 534) comes from cask no. S060710009, with a date stamp of May 14 2012 (there is no age statement). Fully matured in a sherry cask (I'm guessing oloroso? ), it is non-coloured and non chill-filtered. The colour is Cherry Coke. The nose is - wait for it - flat Cherry Coke. Rich dark fruits, nutty, mincemeat, mocha, even beef stock. Lots of sherry, almost as if it was added to the spirit (I mean that in a good way). As rich and delicious a nose as you could hope for. Becomes a little more herbal with the addition of water (but you have to add quite a bit to get any effect whatsoever). There is an immediate sting on the lips, and is very mouth-drying. Cocoa, heat, rich spices like cardamom and cumin, and lots of sherry wood. Bitter herbs and finely ground espresso. Completely mouth-coating. Some lemon zest with the generous addition of water. Unforgettable in its richness and power. @talexander - next session will see some primo tobacco! @Pudge72 - that is an excellent suggestion, although the look of pain on the face of most store managers when the request is submitted and the antiquated "windows 7 sticky-note on the wall app" makes these requests awkward. I wish there was a web site shop with delivery to a store nearby - the face to face is not always a rewarding experience, although there are a few LCBO employees that can get it done professionally and in an expeditious manner. 'Paddockjudge', can you have the bottle (especially one of that value) transferred to a store closer to you? If the bottle actually exists of course. The LCBO website definitely has 'ghost bottles', as I have found out the hard way in the past. I've hunted Kavalan for years, ever since I first heard about it from the Whisky Bible, whiskies that were no age statements and just legendary in flavor and aroma. I hunted this distillery by calling liquor stores all over Australia and Scotland, trying to find somebody, any body, who had a bottle that they'd sell me. No one had any bottles, no one had ever seen a bottle. Most never had even heard of Kavalan. I heard "Kavalawhat?" more times then you can count. I finally managed to find the phone numbers for distillery showrooms in Taiwan whom I rang, and discovered that if you didn't speak Chinese you might have problems trying to order whisky. I email them and get a reply back, yes they do indeed produce the whisky, however they won't ship outside of Asia. They have no plans on exporting it to Australia, however maybe in a few years they'll possibly export. So for the next couple years whenever a friend went to Singapore, Malaysia, Vietnam, etc etc etc I send them with money, hundreds of dollars, and orders to find me a bottle or two of these whiskies and bring them back to me. I see Kavalan on auction sites oh so rarely and bid madly for them when I see them. However I'm forced to drop out of the race when prices move into the hundreds of pounds for a 200ml bottle. I think to myself, one day, one day I will put my hands on a bottle. And then, quite by accident, after hunting it for years, it quite literally fell into my lap. Working for a beer importer I talk to our reps all the time and being a whisky geek they know to keep an eye out for bottle shops with a good selection of whisky. One day one of our reps tell me about this little bottle shop, almost an hours drive from my house, that is supposed to have a great selection of whiskies. I follow them on Facebook and shortly after doing so, less then a week in fact, they post about a Kavalan tasting that they'll be hosting. $30 for 7 samples plus a light dinner. Now the week drags by until the day of the tasting, I've set aside money, lots of money in fact, once I confirm that they will have Kavalan for sell after the tasting. When we arrive at the tasting, the bottle shop is literally everything that I've heard it is, wonderful selection of whisky at really reasonable prices. We then head up to a little Italian restaurant for the whisky tasting and all I can say is that it looks like it's going to be fun. The tasting is informative and nicely run, however the smells of the cooking food are overwhelming the whisky for me, especially considering the fact that I'm really trying to focus on the speaker, who it turns out is one of the owners of the company that will be running Whisky Live in Australia. I decide that I won't be doing tasting notes for any of the whiskies that I don't purchase, but that's ok, because I'm getting a BIG kick out of these guys so I know I'm going to buy at least a couple. End of the evening I walk away with one of each of the cask strength whiskies which really made my night. The ex Bourbon cask, the Sherry cask and the Vinho cask. Tonight I sat down with the sherry cask strength and the first thing I can say is that it takes my breath away when I pour my dram into the glencairn, it's possibly one of the darkest whiskies I've ever seen. Most of the Kavalan whiskies are aged for around five, six years or so. How do they get SO MUCH color into the whisky?! Can't wait to get into it though so here we go! Sweet baby jebus the nose! Lovely, excellent sherry cask nose, beautifully put together. Toffee, sultanas, figs, nuts, cinnamon, nutmeg, vanilla that slowly gets stronger, and hints of dried oranges. The aroma alone just makes my mouth water and eager to take a sip. Oh god it just gets better and better. Thick, chewy mouthfeel that overflows with the sultanas, figs, dried cherries, heaps of spices from the nose and a tiny hint of coffee. A long lingering dry finish that drops off in intensity fairly quickly, but then the hints of fruit, cherries and sultanas linger on and on, begging you to take another taste. Hands down my favorite sherry bomb, period. When I normally sample a dram for the first time, it's sample, notes and move on. This whisky is one of the few I've ever had that BEGS me to take another taste, so freaking moreish and so beautiful that I know I could drink my entire bottle in a single sitting (it is a 200ml bottle) and still want more. This whisky definitely lived up to my expectations, actually it blew my expectations away, and I do believe I'll always have to have a bottle of this in my cabinet from now on. Not the cheapest whisky in the world though, sitting at around $75 for 200mls at this point, but hopefully once you can more easily find bottles on the market the price will come down a bit, or the bottles will get bigger as it is almost too drinkable for a 200ml bottle. If you ever get a chance to try this, don't walk to the tasting, RUN! @Hunggar I completely agree that this whisky is also a step above all of the incredible Abunadha's that I've had before. Bloody impressive considering it's such a young whisky from a distillery no one had ever heard of 10 years ago. However it is amusing that you agree with me because a whisky friend that I know completely disagrees that this is hands down the best sherry cask whisky I've had. :D Can't wait to review the Vinho cask! I totally agree with you. In my book, this one's even a step above the might A'bunadh. No small feat for a three(ish) year old dram from Asia! If you've been reading my reviews thus far, you know that I've decided to take it upon myself to get the word out about Taiwanese whiskies. I'm doing this for three reasons. One, I live here so they're both accessible and cheap (says the guy on a budget). Two, they're often overlooked because they aren't widely available in the west. And three, they're damn good. Obviously there's a lot of talk out there about Scotland and the other heavy hitters like America, Canada, and Japan. But there's some great up and coming scenes in the world of whisky like Europe, India, and, naturally, Taiwan. 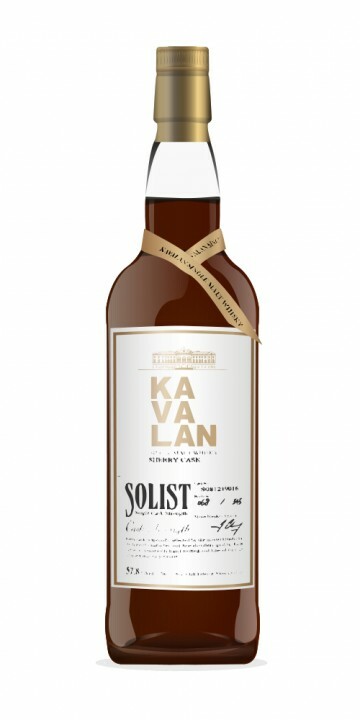 Here's a personal favorite; Kavalan Soloist Sherry, released at cask strength. No age statement, but given the distillery has only be open for 7 years, we can assume it's quite young. Presented with a beautiful dark raisin colour. Here we go. Nose: Sherry notes, but not typical. Loads of raisins and dates, prunes, nuts, cinnamon, and bitter dark chocolate. Extremely dry and very earthy. Deep, dark, caramel. Here's a new one for me... balsamic vinegar, without being acidic. Complex and unique. Palate: Quite an oily texture. Dry. Dried sweet plum. Bitter chocolate and roasted nuts. Dates, raisins, and Christmas cake, building towards a crescendo of intense spices. Very layered. Finishes with dried fruits again and deep oak notes. This is different than typical sherry bombs. Firstly, it's more intense. Secondly, it's not as sickly sweet as others. There's some caramel and syrup notes, of course, but they're not overwhelming. This is a dry whisky in the best kind of way. The roasted, bitter notes offer a level of sophistication that's a step up from some lesser, oversweetened drams. It doesn't depend on syrup or caramel. They've taken a backseat to let the fruity notes flex their muscles. Loving this bitter intensity. Very rich and complex. Wow. This one is a personal favorite. It's distinctive, sophisticated, rich, intense, and complex. Absolutely wonderful dram. Kavalan Solist Sherry is every bit as good as you say. Thanks, @hunggar, for taking the initiative in circulating information about the Kavalan line. Great review. Kavalan distillery is located in the northern part of Taiwan, 60 kilometres south of Taipei. It was built over an eight month period in 2005 and 2006 and uses copper stills that were constructed in Scotland. The distillery boasts an annual capacity of approx. 3.9 million litres. The name of 'Kavalan' is taken from a group of indigenous people who once lived in Yi-Lan County where the distillery is based. The Solist Sherry Cask is a three-year old cask-strength whisky that was matured in ex-Oloroso sherry casks and was released in 2009. The nose reveals deep, rich sherry notes, followed by dried fruits such as figs, raisins, and prunes. Astonishing depth for a three-year old whisky! Sadly an acidic note is hanging over the whole. With water the acidic element disappears, revealing sweet peaches and milk chocolate. The palate resembles a weird rollercoaster ride. It starts full-bodied and boasting, then gets very peppery and thin at the same time, almost to the point of becoming watery. There are again prunes and peaches, now joined by sweeter notes like red currant syrup. The finish is of medium length and quite warming, beginning with a wave of pepper across the tongue, then getting sweeter and sweeter towards the end with syrup and jelly beans galore. I am very impressed by the fact that this single malt is only three years old. If I was given this in a blind tasting I would definitely say that it is much older. So kudos to the people at Kavalan for putting this together! Sadly I was a bit put off by the acidic note hanging over the nose, and the sweetness during the finish was simply too much for me. I am being told that the sweetness is important to consumers in mainland China which is the most important market apart from Taiwan. That might be the case, but this is not what I am looking for in a whisky. Colour:Beautiful dark Copper , almost mahogany. All natural, no colour added. Wow! I love this one already. Nose : Big sherry. Starting with some balsamic sourness, then off to the big sherry party. Dried fruits galore (plums,prunes,sultanas) , quite alcoholic at over 57%.... Nuts topped with Marzipan and some Sugar dough. Very aromatic and deep. This feels much older than 3 years of age. Wow. I am liking this nose already! Palate: Big body, oily and very deep. the dried fruits are overwhelming, dipped in rich syrup of alcohol,sugar and Spice. on the second wave of sensations i am getting some coffee and cocoa bitterness, which is quite nice to balance out the syrupy sweet dark fruits. Finish : Long, sweet, coffee , the dried fruit and syrup are also there for quite some time. very rewarding finish, with some oak at the very end. Nice stuff Mr. Chang! Bottom line: This is a cracker of a dram. thick, powerful and masculine. reminds me of the Aberlour A'bunadh in some ways (Young, in your face sherry, natural) . A Sherry monster, from Taiwan. I want a bottle, sadly it’s so hard to come by. This is by far the best and most enjoyable dram from Kavalan I’ve sampled. Sheer pleasure, much better than the previous two, and this one can look in the eyes of any Scotch sherried dram and not squint. It’s absolutely well done. Impressive stuff!